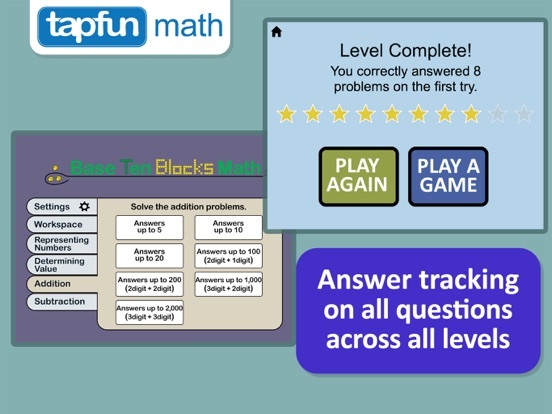 Base Ten Blocks Math Pro by Tapfun Inc.
Base Ten Blocks gives students hands-on practice with place value! Designed with the input of several expert educators in the U.S. and Canada, this app provides a range of activities for students at all levels and learning needs. This is ideal for Kindergarten, First Grade, Second Grade and Third Grade. 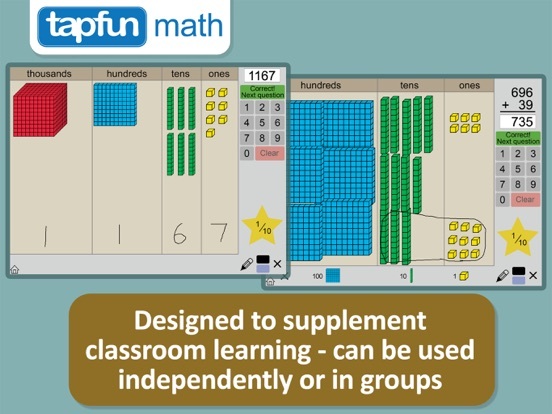 Experience interactive manipulatives in your classroom! Note that we offer the 50% school discount through the Apple Volume Purchase Program for Education. ① Blank Workspace - Adjust the Block settings and Place Value Chart settings to customize the Workspace. The Workspace is an open canvas. 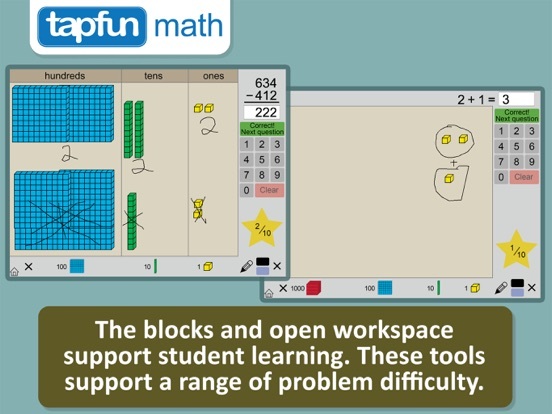 By using the pen tool and the blocks, students can explore problems assigned by the teacher. ② Representing Numbers - Choose from one of six levels: up to 5, 10, 20, 100, 1000 & 5000. Represent the number provided with blocks. After entering the blocks the screen, click on ‘Check Answer’. If the answer is correct it will move to the next question. ③ Determining Value - Choose from one of six levels: up to 5, 10, 20, 100, 1000 & 5000. Determine the value of the blocks and enter the correct answer. ④ Addition (up to 3digit + 3digit) - Solve the problem and take advantage of the blocks and pencil. ⑤ Subtraction (up to 3digit - 3digit) - Solve the problem and take advantage of the blocks and pencil. 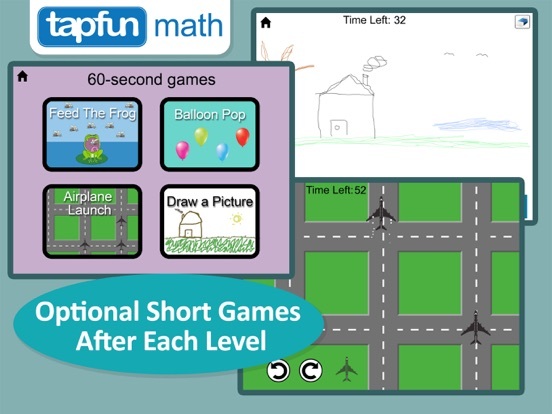 If you are interested in evaluating this app in your classroom please register at tapfun.com. Base ten blocks are a mathematical manipulative used by students to learn basic mathematical concepts including addition, subtraction, number sense, place value and counting. 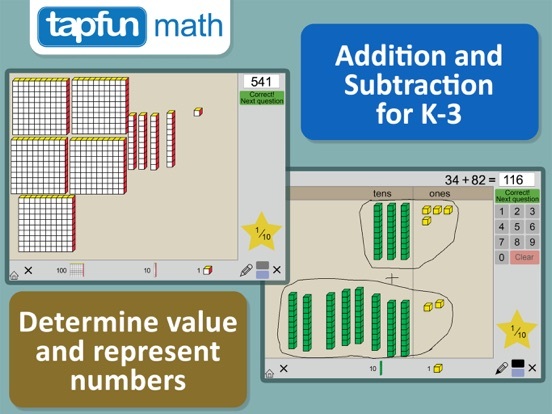 The student can manipulate the digital blocks in different ways to express numbers and patterns. Base ten blocks are popular in elementary school mathematics instruction. They are frequently used in the classroom by teachers to model concepts, as well as by students to reinforce their own understanding of said concepts. Manipulating objects is an important technique used in learning basic mathematic principles, particularly at the early stages of cognitive development. Regrouping is the borrowing of a value from one column of numbers to another to aid a mathematical operation. If one is subtracting, it’s necessary to regroup when the number at the top of a column is smaller than the one below it. When subtracting numbers with more than one digit, write down the larger number first, followed by the smaller number directly below it. For instance, write 15 below when subtracting it from 32. Since 2 is smaller than 5, by regrouping, two becomes 12 when a 10 is borrowed from three on the column to the left. Likewise, 3 loses 1 to become 2. Subtracting 5 from 12 above it on the right column and 1 from 2 on the left column gives 17 as the answer to 32 - 15.